The EMV (Europay, MasterCard, and Visa) chip and pin standards become mandatory on October 1, 2015 for all United States businesses that accept card payments. Businesses have less than two months to comply, and recent reports indicate that not only are businesses lagging to meet the deadline, an unsettling amount of business owners do not even know about the deadline. In fact, more than half of small business owners in the United States are unaware of the change, according to Wells Fargo’s quarterly small-business survey. To mitigate this problem, we decided to list the most common questions we have been receiving from our own merchants and agents about EMV. Use this article as your resource guide for whatever questions you may have about EMV compliance. What are the EMV standards? The new EMV standards are certain rules that regulate credit card transactions. To understand EMV, you have to first understand the purpose behind the new chip and pin cards. OK, what are chip and pin cards? How does EMV relate to them? All consumers in the United States are now being issued or reissued credit cards that contain an EMV chip and pin security feature. You have probably seen a credit card with the chip on it already. The purpose of the chip and pin is to better protect against fraud and counterfeiting by storing card information in a microchip on the card. Previously, credit cards stored card information on the magnetic strip on the back of the card. The information was processed when the consumer swiped the credit card in a card terminal. This process, though, is fairly easy to compromise and steal the card information. The new chip and pin cards are safer because they process information by sending encrypted card information to a secure device in an EMV-compliant card terminal. Credit card terminals that are not EMV-compliant cannot process the new chip and pin cards. Who created the EMV standards and who is enforcing them? EMV stands for Eurocard, MasterCard, and Visa, the biggest names of the credit card world, and they are the organizations that designed these new specifications. The EMV standards have actually existed and been used in other countries for years; the U.S. is one of the last Western nations to adopt the standards. American Express, Discover, MasterCard and Visa along with major U.S. banks agreed to implement the standards and are the bodies issuing chip and pin cards. These entities determined that October 1, 2015 would become the deadline for U.S. business to comply with the new standards. Why is this change happening now? As mentioned earlier, this chip and pin technology has existed and been used for years in other countries. The long and short of it is that chip and pin transactions are much safer, and the U.S. is finally adopting them. If you are still dubious whether chip and pin transactions are that much safer, consider this: half of all credit card fraud occurs in the United States. This is particularly upsetting when you realize that only one quarter of all credit card transactions in the world occur in the U.S. So, while EMV compliance may be a bit of a hassle, it is a must to protect your customers against fraud and to protect your business against liabilities. Who has to comply with EMV? Any U.S. merchant who accepts card payments must be able to process chip and pin cards by October 1, 2015 to avoid liabilities for any fraudulant EMV transactions. How do I make sure my business is compliant with EMV? If your business accepts card payments, then it must be able to process the new chip and pin cards. If your card machine cannot process a smart card when it is presented and you run it using the magnetic card reader, and if that transaction is fraudulent, you would then assume liabilities for that transaction. The easiest way to determine whether your machine accepts chip and pin cards is by testing it yourself with a chip and pin card. Place the card in the slot. If your machine does not have a slot for smart cards, then your machine definitely does not process chip and pin cards! If it does have a slot and rejects the card, then you know the machine cannot process chip and pin cards. You could also make a quick Internet search of your specific card machine to determine whether it is EMV compliant or not. If your machine is not compliant, then you must get one that is. Mostly newer machines are EMV-compliant. 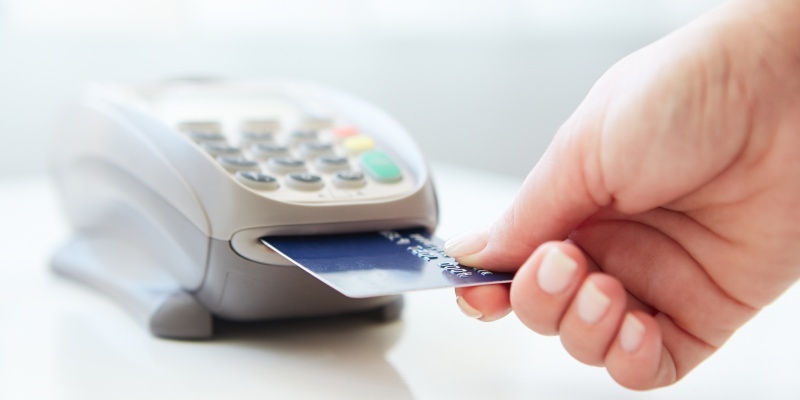 How much does an EMV-compliant card terminal cost? The cost for EMV-compliant machines generally starts at around $200 and goes up. If you have a merchant services provider, then you should contact them and discuss your options. Some processors, such as Merchant Service Group, LLC, offer their merchants free upgrades to EMV-compatible terminals. Others may have special deals or promotions as well. What happens if I do not comply with EMV by the October 1 deadline? It is understandable if you feel like the cost of compliance is a burden, but consider this: if you are not compliant by October 1, and your business continues processing cards, you could face steep liability costs. If your card machine cannot process a smart card when it is presented and you run it using the magnetic card reader, and if that transaction is fraudulent, you would then assume 100% liability for that transaction. While the cost of implementing an EMV-compliant machine at your business may be inconvenient, it is much cheaper than the cost of fraud liability. How long does it take to setup an EMV-compliant machine, and do I still have time? Yes, you definitely still have time! It only takes a few hours to get an EMV-compliant system set up, just like it does for any card processing system. What might take longer is obtaining the system itself, depending on where and how it is shipped. But those details are easy to discover once you speak with your merchant services provider or start shopping for a machine. Do you have a list of EMV compatible terminals? We do! This is not an exhaustive list, and we will continue to add to it! For more information, please email or call us at info@merchantservicegroupllc.com and 888.628.6671.